Stienecker: Lyft has helped boost business without adding loaners or shuttle drivers. Kipp Stienecker had a dilemma. 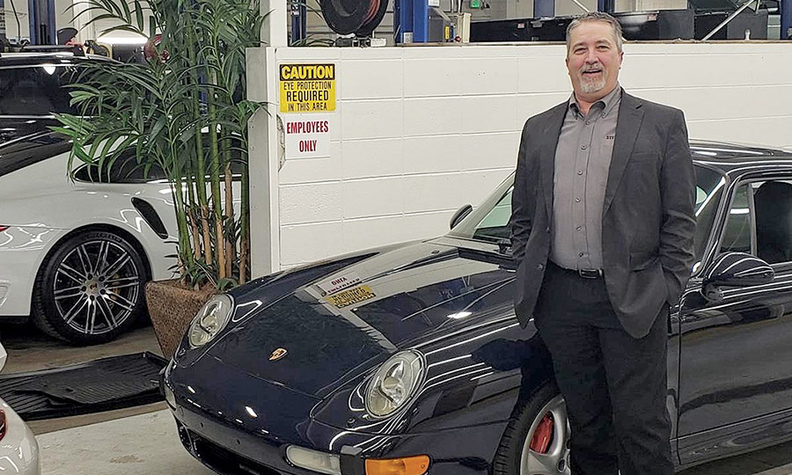 His service shop at Stevinson Imports, a Porsche and Jaguar dealership in Littleton, Colo., was drawing plenty of business from the store's affluent clientele. But it had to turn some customers away for lack of loaner vehicles. This meant the service center, a key profit hub, couldn't reach its full potential. Investing in more loaners wasn't a cost-effective answer. Stienecker, the service manager, said the store's loaner fleet already had 45 Porsches and Jaguars with a minimum list price of around $60,000. Getting more, and maintaining them, would further eat into profits. Hiring more shuttle drivers, for $3,000 to $3,500 per month each, was equally unattractive. So in late 2017, Stienecker turned to ride- hailing service Lyft as an alternative, allowing him to take on more service business without the cost of more loaners or shuttle drivers. "So far, it's a been a positive," he said. Lyft, like rival Uber, has been stamped by some as a disruptive threat to the auto industry, on the grounds that the popularity of ride-hailing services will reduce the need for personal vehicle ownership and cost automakers and dealers business. But Lyft is turning to the dealer world with a different proposition: Let's do business together. Last month, Lyft set up shop at the National Automobile Dealers Association Show for the first time to make the case that its network of drivers can provide dealers a transportation option that'll make their service departments more convenient for customers. "What we've heard from dealers is that the shuttles lead to poor customer experience," said Tom Leahy, a strategic account executive for Lyft Business, Lyft's commercially focused unit, who was staffing the company's NADA booth. "Nobody wants to wait 45 minutes." Plus, he said, "there's high liability involved with the shuttle as well. It puts a strain on your service revenue." "I would rather use Lyft than employ two or three [shuttle drivers] to do the same job," he said. "From the risk, there's so many things involved with having a shuttle driver on the road 10 hours a day. There's accidents, expenses for the car, everything wears out." Early on, Stevinson Imports' service staffers used their own phones to set up Lyft rides for customers, as the typical user does. This proved inefficient, so the shop adopted Lyft Concierge, a Web platform for businesses that lets them hail rides on their computers. The dealership covers round-trip fares for customers who leave their vehicles, and sometimes upgrades customers to luxury-vehicle rides. Stienecker said adding Lyft has led to a 9 percent year-over-year rise in repair orders for the service department, which can now accept more vehicles without worrying about loaner or shuttle availability. Even with the cost of the fares, Stienecker figures the dealership comes out ahead. The nearly $2,300 a month that the dealership spends on Lyft wouldn't cover the cost of even one shuttle driver, let alone shuttle upkeep, he said. "When you consider insurance, employee benefits, just to have a $13- to $14-per-hour person to drive the shuttle, you're going to spend $3,000 to $3,500 per person," Stienecker said. "If you have two shuttle drivers, that's $7,000 a month." That's not to say the Lyft fares won't add up as service business increases. Keyes Bell Road Toyota in Phoenix used to employ three shuttle drivers and maintain two vans, at a cost of about $11,000 a month. Like Stevinson, Bell Road freed itself from those expenses when it began using Lyft Concierge in 2016. Bell Road also found that after Lyft was made available, customers were more likely to drop off their vehicles instead of waiting for same-day service. That's a win for the store because those longer stays tend to bring in more cash, said Scott Huggett, the service director. The average repair ticket at the store has gone up $20 to $30 in recent years, an increase that Huggett attributes in part to Lyft. The store's first monthly Lyft bill was about $4,800, Huggett said. Over that first year, the typical bill came in between $4,300 and $6,300. The second- and third-year figures amounted to around $7,300 to $8,300 a month. Last month, the dealership paid close to $10,000 for around 920 rides. As the dealership gets busier, Huggett wonders if his store may need to modify its approach to Lyft. The dealership, about 15 miles north of downtown Phoenix, has been sending customers "all over the place," so Huggett said his department may have to put some restrictions on the service. One option would be offering rides within 10 miles. If the ride is farther, he said maybe the store would cover a one-way fare to the customer's destination, but not the return. For now, though, he's happy to give customers an alternative to waiting for a shuttle. In years past, some consumers may have left the store when they realized they'd have to wait for a shuttle that was already on the road with five passengers. "In many cases, we tried to reschedule and get them back," Huggett said of customers who didn't want to wait. "But how many of them came back for sure? I would rather keep them here and get them home or to work faster, and as a result, I know I'm going to retain more business."